The idea of embarking upon a seascape painting is often exciting. But expressing in paint the sensations of standing on a rocky cove or cliff top, watching the waves crash against the shore can often result in disappointment. The photographs may not convey how large the waves actually were; the sea appears as a grey, flat expanse that fails to inspire. What can the artist do to paint a dramatic seascape in oils? Painting the sea can be fraught with difficulties, as the real life experience is often more intense than photos can convey. Most artists would find transient waves difficult to capture in sketch-form from life. Unless the scenery is viewed from afar on a settled day, as can be seen in Loes Pool, Cornwall in the UK, photos are often heavily reliant upon. So in a bid to capture huge waves hitting the coast, the artist may happily click away with the camera, only to be presented with shot after shot of the same, bland sea images that do not reflect the drama of the day. The waves may appear miniscule, the foam, as a small white blur, and the sea itself, a grey slab. Again, insistent idealized notions about a beach may spoil a painting. The sand for instance might be illustrated as yellow; the sea as bright blue. 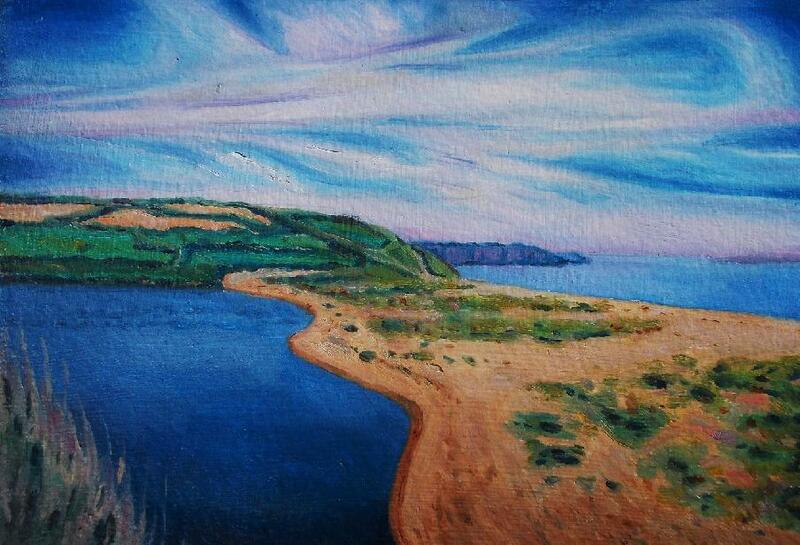 View my Youtube clip on how I painted a section of the Cornish coast in the UK in limited steps. As can be seen, I worked from a photograph that offered interesting compositional shapes. The odd-shaped rock provided a suitable focal point; the foam provided stark contrasts against the blue-green sea. If trying to capture sea-spray or large waves, zoom in a little. Taking a wide screen shot will make the largest waves appear small. Get as close as possible without getting into danger. Create a sense of scale by including a frame of reference, such as an outcrop, a sand bar, a headland or building such as a lighthouse. A wide expanse of sea can appear featureless and bland in a painting. Be aware of the light. An overcast day will not bring out the contours of rocks or cliffs. Oblique lighting such as that found early or late in the day will cast interesting shadows over the rocks. Similarly, a sandy beach will appear violet, orange or gold in different lighting conditions. Shadows will appear blue or indigo. Be aware of the sky, which will often take up a major portion of the painting. Wait for interesting clouds, such as mackerel sky or cirrus. Avoid a white, featureless sky if possible. Don’t accept the first view that presents itself, try out different vantage points. Crouch down, stand on a rock or move around to find the best composition from the chosen location. Look for interesting contours of the coast. Some coastlines have odd shapes, such as that found in Cornwall or North Wales. Interesting outcrops of land will break up an everlasting horizon that serves merely to split the image in two. A cold, blue-brown, as seen when the surf picks up the sand: burnt sienna and pthalo blue. A warm, turquoise blue, as seen on Mediterranean coasts: pthalo blue and viridian. A cool midnight blue as seen further out to sea: ultramarine and a little burnt umber. A warm, violet blue as seen out to sea on calm, clear days: ultramarine, a little permanent rose and burnt umber. A dull, slate blue as seen in bad weather: burnt umber and pthalo blue. An array of art methods can be used to bring out the drama of a coastal scene. Impasto paint can be pasted on to suggest the textures of the rocks. Thinned oil paint flicked from a brush will help suggest foam and spray. Fine blending from a sable will suggest the misty distance at the horizon. This same, smooth blending can also be used for large swells and tidal waves. The dabbing on of thick, white paint will suggest white seahorses that can often be seen in rough weather. Notice that foam is not merely white, but will possess other, subtle colors, such as china blue or pale grey. These slight color variations can be use to help suggest form to the crashing waves. 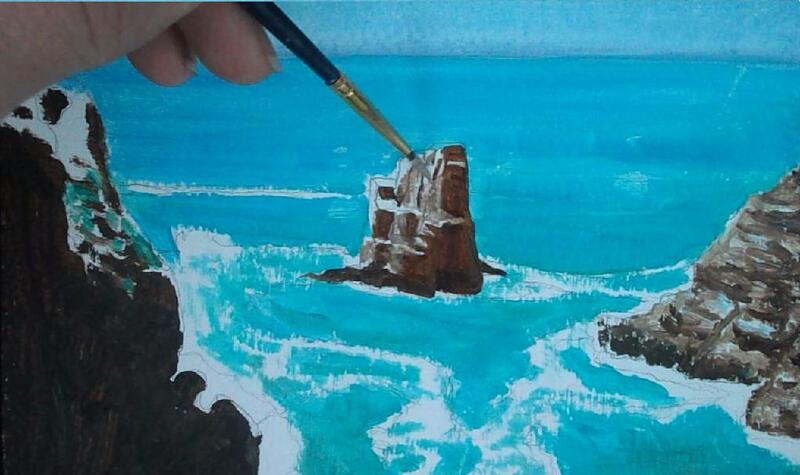 In the youtube clip shown above, I applied the palest areas of the sea first. This prevented color contamination from nearby darker colors. I was then able to blend the pale colors into neighboring darker colors if need be. The rocks were painted lastly, as they possessed heavy hues. Sea spray can be easily applied on top. The sea can be notoriously tricky to paint, as the drama will not always be conveyed onto photographs to be worked from. The secret is to take lots of shots from different angles and to zoom in to the drama. Notice how the sea varies in color within different weather and the underlying terrain. Some coasts will present a brownish sea; others, a sparkling turquoise. To avoid a featureless, flat sea painting, look for features that break up the horizon, such as odd-shaped coasts, rocks or buildings. The light can do wonders for a sea painting if it describes form. A large sky that possesses interesting clouds can be used to enhance the atmosphere of any sea painting.